The iPhone 3G S unveiled by Apple Monday has the latest of everything, including 7.2 HSPA, the fastest mobile broadband flavor currently available for U.S. 3G networks. This updated 3G network might nearly triple the top downstream rate of its predecessor. The only trouble with the faster speed? AT&T hasn’t rolled it out yet. While dozens of carriers worldwide have put the 7.2 Mbps flavor of HSPA in the field, AT&T is still in the planning stages. The firm has a vaguely stated schedule in place. The company said a few days before the iPhone 3G S was announced that 7.2 HSPA would start appearing on cell towers “later this year.” However, the full upgrade of AT&T’s 3G network won’t be complete until some time in 2011. 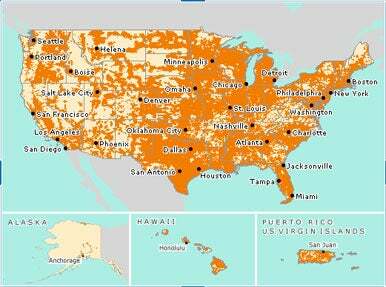 AT&T offers maps that show the specific coverage of its 2G and 3G networks. It will be interesting to see if it differentiates the 3.6 HSPA and 7.2 HSPA networks as the faster form pops up. Would it make sense to avoid buying an iPhone 3G S if you live in an area that doesn’t wind up with 7.2 HSPA until 2011? Only if speed is your only criteria. And you can’t get on a faster network with a phone today, in any case. HSPA (High Speed Packet Access) is actually two separate standards: HSDPA (for downstream) at a raw rate of 7.2 Mbps and HSUPA (for upstream), likely at raw rates of 1.4 Mbps or 1.9 Mpbs, the two most popular upload speeds deployed by existing 7.2 HSPA carriers. The 7.2 Mbps downstream and 1.4/1.9 Mbps upstream rates represent the full bandwidth available in a given HSPA channel, but don’t translate to what an individual user will see. For AT&T’s current HSPA system, the company claims range from 700 Kbps to 1.7 Mbps downstream, and 500 Kbps to 1.2 Mbps upstream. If AT&T sticks with the 1.4 Mbps HSUPA flavor it’s clearly currently using, upstream rates would stay the same; if the company opts for 1.9 Mbps HSUPA, the upper end of the upload rate would only increase by 25 percent or so. AT&T has clearly been preparing for a new, faster iPhone, announcing at the same time as its 7.2 HSPA upgrade a host of other improvements to offer more cell frequency in major metropolitan areas, more cell sites, and improved cellular backhaul. More frequency means less competition for scarce mobile bandwidth among phones and other devices. More cellular sites mean fewer devices associated with each cell station, allowing greater bandwidth for each device. And more backhaul means bringing in the ability for a cell tower that once carried 1 Mbps or so and now may need to push 30 to 50 Mbps out to handle all that traffic. Some of the frequency added is in the lowest cell band, at 850MHz. These lower-frequencies signals penetrate through walls and other obstacles better to improve coverage inside. The march to a faster 3G—7.2 HSPA is sometimes called 3.5G—will continue unabated. Several carriers have already installed 14.4 Mbps HSDPA on their networks, and a 21 Mbps flavor is in service in Austria, Australia, Hong Kong, and Singapore, according to the GSM Association. AT&T has already signaled its next two moves. It expects to jump to 21 Mbps after 7.2 Mbps, and has a fourth-generation (4G) standard called Long Term Evolution in the wings that promises 50 to 100 Mbps of raw speed. There’s no date for 21 HSPA, but AT&T plans to have trials of LTE in place by late 2010 and commercially available service in 2011. Does that mean in June 2010, we can expect an iPhone 3G S+, and in June 2011, an iPhone 4G? With AT&T’s roadmap announced—similar to that of other carriers worldwide—it’s hard to see an alternative.